SPECIAL PRINCESS HAND FAN COLLECTION. Comes in a case and a box. Color: Bronze Lace with Bronze Wooden handle. 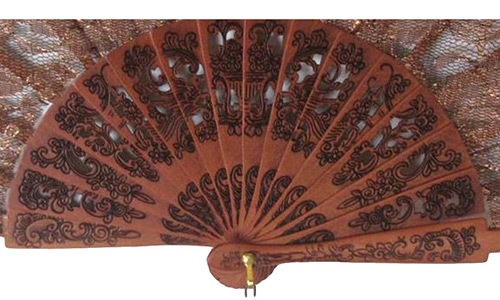 This Spanish handpainted wooden fan is a high quality traditional imported fan from the most prestigious manufacturer in Spain. The fan has been signed by the artisan who hand painted this piece. It is a very useful item during hot summer days and nights, it fits perfectly in your purse so you can take it to any event like weddings, dinners, etc. Return Policy: Items must be shipped back to us within 48 hours from delivery. All items must be shipped back unused. This fan is made out of light weight-wood so it is easy on your wrist when you use it. It is perfect as a decorative accent piece, or to collect (there are many styles), we have stands available especially for fans. They are a work of art in every detail. Each fan comes in a box. Unfortunately pictures don´t reflect the true beauty of these pieces, but we guarantee your satisfaction.